Last week the Synthesis team attended a gathering of the JISC Activity Data projects for the programme launch event. - The Harvard Library Innovation Laboratory and its work around the display of live circulation data. - and the Journal Usage Statistics Portal (JUSP) project. Andy kindly painted a picture of the Synthesis Team as a band of renegade dental extraction enthusiasts which will hopefully prove to be far from the truth - I'd like to think that our approach will be relatively painless; more Derren Brown than Sweeney Todd (with sincere apologies for the barbaric mixing of metaphors). If Andy's introduction to our team did leave you feeling a little trepidatious then a quick read of 'Tips for overcoming a fear of dentists' should set you right (just replace 'dentist' with 'synthesist' for the required effect). In practical terms this means we will be writing technical 'cookbooks', 'How-to'/'Exemplar' mini-guides and a final synthesis report. We will be delivering a number of events to enable projects to share knowledge and good practice (the first event will be an Online Technical Exchange taking place in the first week of April). We'll also be a source of information and advice through the live synthesis that takes place here on this blog, and developing online advice/FAQs via Quora. Finally we'll be gathering project knowledge and artefacts into a space online, around which a Community of Practice can draw together. All of the 9 Activity Data projects had a presenting slot so that they could share the hypothesis that sits at the core of their project and as much other information as they could cram into the 5 minutes they were allotted. This gave projects the opportunity to start making connections between their projects and identify potential areas of overlap in terms of scope and technical challenges. The rest of the day was spent particpating in interactive sessions which were useful in revealing further details about the projects and other areas of overlap/shared pain. Mark van Harmelen led a session on identifying the key technical challenges faced by projects and the key technical benefits that they will potentially be delivering back to the programme and to the wider community. 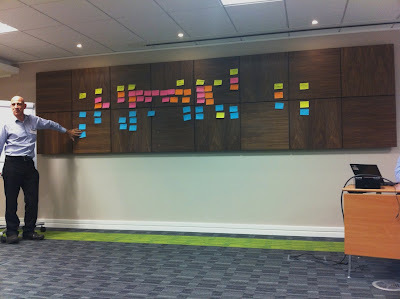 You can see from the photo below that this resulted in a proliferation of post-it notes which were placed in their 'natural' groupings and ocassionally fluttered to the floor in a most delicate manner. Mark collected all of the post-its and plans to produce a document that shows the groupings which emerged. In the afternoon the project representatives were asked to identify the key IPR challenges their projects face. The discussions on our table reflected some of the other groups and centred around the issue of establishing 'robust anonymity thresholds' (or 'the magic number') for any data that will be released (both internally and externally to the institution). Tom Franklin ran the last interactive session of the day which was an exploration of the projects' business case. His definition of a business case as "something you need in order to get money from someone who doesn't want to give you money" seemed a particularly useful way of keeping the correct audience for the business case in mind (i.e. the person with the money, not the person who wants to get hold of the money). The final session of the day was a synthesis of the days discussions, which will form the basis of a near-future blogpost here.